Obituary for Myrtle Ellen (Campbell) Shaklee | Lanman Funeral Home, Inc.
Funeral service for Myrtle Ellen Shaklee will be Tuesday, October 23, 2018 at 2:00 p.m. at Nash Christian Church. Burial will be in Timberlake Cemetery with arrangements by Lanman Funeral Home, Inc. of Helena. 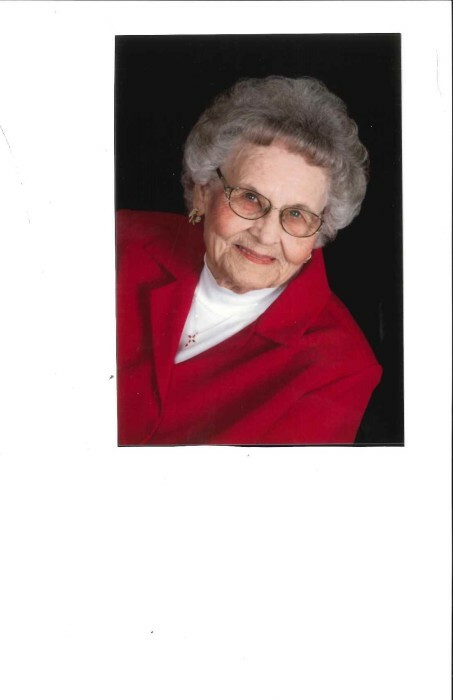 Viewing will be Monday 10:00 a.m. to 7:00 p.m. with family present 5:00 p.m. to 7:00 p.m. www.lanmanmemorials.com Facebook: Lanman Funeral Home Inc.
Myrtle Ellen Shaklee, daughter of the late Don and Irene Wilcox Campbell and oldest of seven children, was born on July 22, 1923 at her home near Jet, Oklahoma. She passed from this life at Fairview Fellowship Home at the age of 95 years on October 19, 2018. Myrtle and Merwyn J. Shaklee were united in marriage on July 13, 1942 in Enid, Oklahoma. To this union two sons and one daughter were born. Her life was devoted to her family and her church. Music was a big part of her life as she led the singing from a young age until the Jet Christian Church closed its doors. God gave her a talent she could use to serve others. She was very devoted to her son, Rodney, who was always by her side. Myrtle worked for the Oklahoma Agriculture Statistic Service as Supervisor for fourteen years. She also served on the Alfalfa County Hospital Board. She and Merwyn had been engaged in farming most of their married life after Merwyn returned from the service. They enjoyed following their four granddaughters activities until they were no longer able to do so. She was a member of the American Legion Auxiliary and also a member of the Nash Christian Church. Myrtle is survived by her son, Rodney Shaklee of Fairview Fellowship Home, son, Rick Shaklee and wife, Bonnie of Cleo Springs and daughter, Roxanne Weeks and husband, Lary of Aline; four granddaughters, Mitsy Shaklee, Amber and Shane Green, Kodee and Ronnie Nickel and Bridget and Cole O’Neil; nine great grandchildren and many nephews, nieces and special friends. She is preceded in death by her husband, Merwyn, her parents and one sister, Donna Smith. Myrtle’s family would like to thank the Fairview Fellowship Home and Faith Hospice for their excellent care of our mother. Memorials may be made to Nash Christian Church or Fairview Fellowship Home through the funeral home.